Have I mentioned we are moving from Southern California to Gig Harbor Washington? As a lifelong Californian I truly have no idea what to expect. 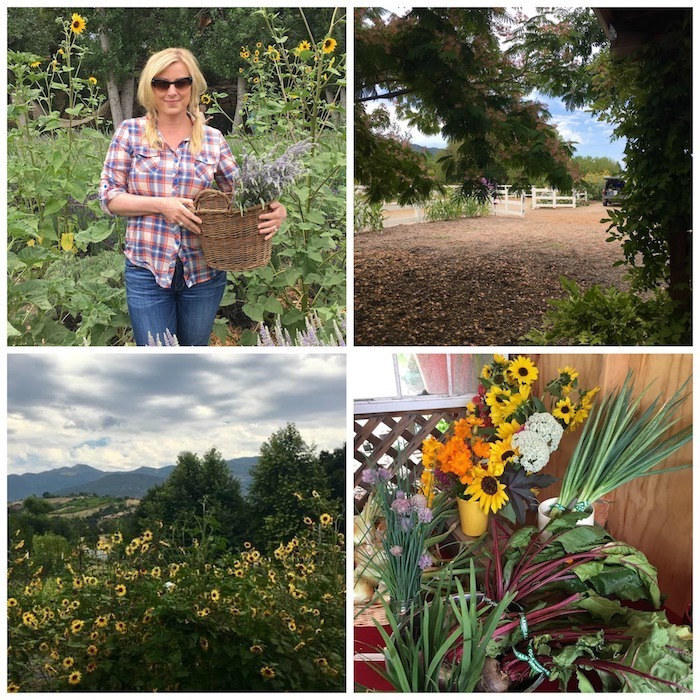 And in the last few months we have been making the most of the sunny Cali weather by taking weekend trips to many of our favorite local destinations, Ojai being one of them. 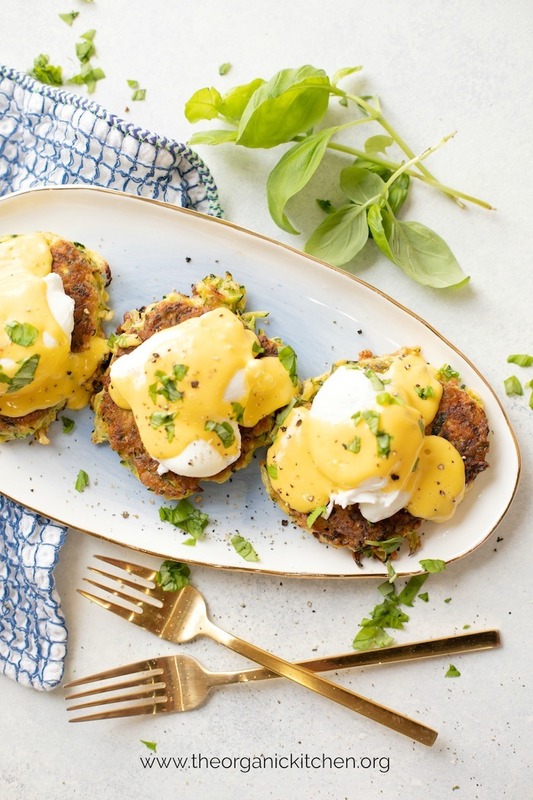 Our favorite Ojai eatery, Azu, serves the most amazing Farmhouse Eggs Benedict on Zucchini Fritters. I came up with my own version so we can enjoy a favorite breakfast after the move! Ojai: Go If You Can! We just love Ojai. It’s nestled in the mountains, just 20 minutes from the beaches of Santa Barbara and has a small town charm that is a mix of cowboy country and yoga retreats. The main street has the most charming shops, a gorgeous park, and truly fabulous food! We also love to visit Frog Creek Farm every summer for lavender cutting and the fresh produce. This Breakfast: Options, Options, Options! While the Farmhouse Eggs Benny at Azu is gluten free, it does have dairy and traditionally made Hollandaise Sauce. My version can be made with regular or gluten free flour, or can be made grain free by using cassava flour. Cassava flour is a miracle! It allows this recipe to fit the Paleo/Whole30 lifestyle while not compromising on taste or texture! 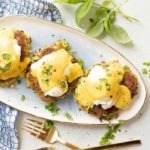 Poached eggs are very easy to make, but a few tips can really help. First, use really fresh pastured eggs (NOT pasteurized eggs…very different!) Second, use a small pot and add a little white vinegar to the water, this prevents your egg from getting slimy. Third, use the vortex method! Wait what??? The vortex? Don’t sweat it, I have a video tutorial that shows you step by step how to do it. 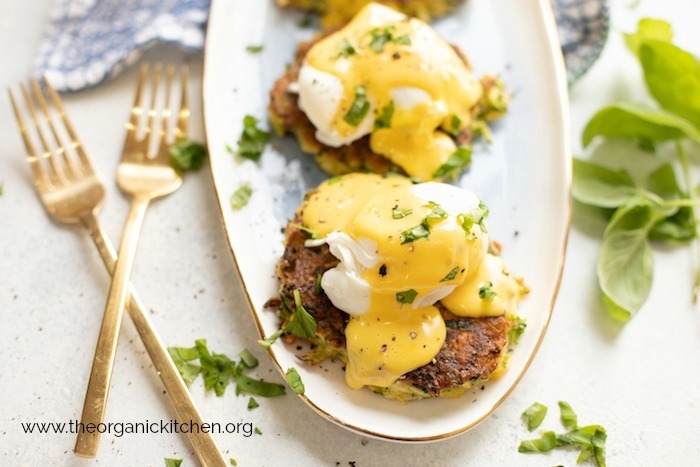 Hollandaise sauce is usually made with butter, and you are certainly welcome to use a lovely grass fed butter in this recipe if you aren’t on Whole 30, but my W30 peeps will be happy to know my sauce is made with ghee, so it’s completely compliant, and honestly I think it’s just as delicious as when butter us used! Tips and what you need: I recommend a cast iron pan for this job. You will also need a food processor or box grater for grating zucchini. I use arrowroot powder for thickening to keep this recipe Paleo/W30. 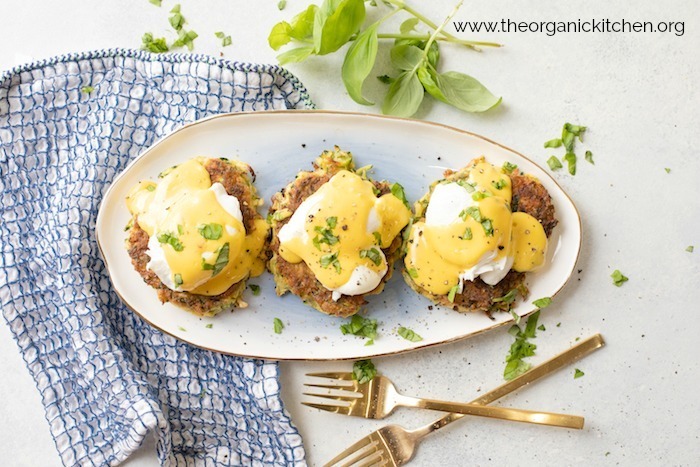 If you have no dietary restrictions you can use corn starch) Flour options include gluten free flour or to make this recipe Whole30/ Paleo I use cassava flour. Grate zucchini, place in colander. Sprinkle with sea salt and toss well. Place colander in sink and allow to sit for 10 minutes. After zucchini rests, place between paper towels and squeeze out excess moisture (or wring out in a clean dish towel) The more moisture you eliminate the crispier your fritter will be, you may need to do this several times with fresh paper towels. Place zucchini in a large bowl. Add egg, your choice of flour, arrowroot or cornstarch, pepper, and half the basil (reserving the rest for garnish). Mix well. I recommend watching the video linked above for a quick egg poaching tutorial. When eggs are done to your liking use a slotted spoon or fish spatula to remove them from water and set on a paper towel. 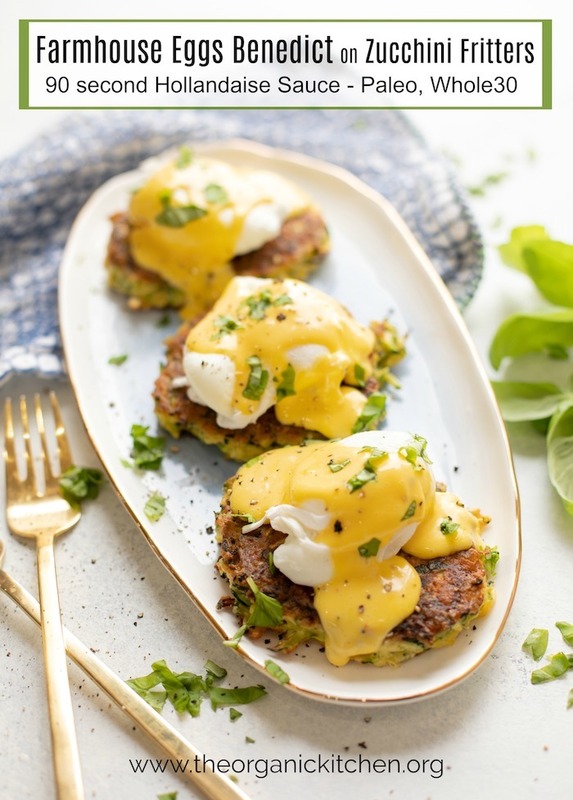 Place eggs on zucchini fritters, pour Hollandaise sauce over eggs, sprinkle with sea salt and pepper, garnish with remaining basil. Serve! Peach, Berry, Burrata and Prosciutto Salad!